GeoTrust is the world’s second largest digital certificate provider and the right choice for small-businesses looking to offer security and peace-of-mind coupled with a brand consumers know and trust. Make a strong security statement with the green address bar. GeoTrust True BusinessID with EV (Extended Validation) is the premium business-class SSL security product, visually confirming the highest level of authentication available among SSL certificates. Multi-Domain – One Certificate, Multiple Domain Names: With the True BusinessID EV SAN you can secure multiple domain names with only one certifcate – all with the green address browser bar. The green bar says it all. Web site visitors really notice when the address bar turns green in their high-security browsers and the organization field starts to rotate between your business name and GeoTrust. Make a strong security statement with the green address bar. GeoTrust EV (Extended Validation) SSL Certificates are premium business-class SSL security products, visually confirming to your customer that your site is safe and the highest authentication among SSL certificates is being utilized. 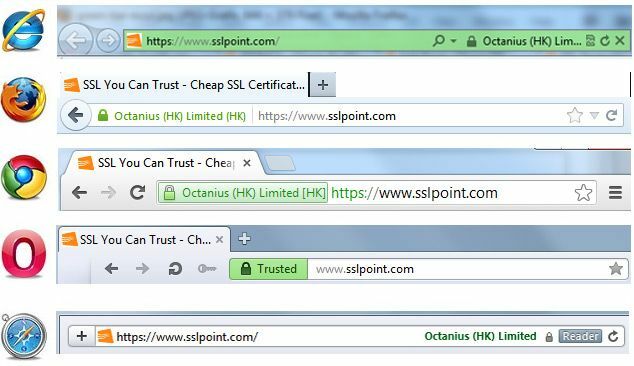 Site Seals are SSL logos provided for free by GeoTrust. You can place Site Seals anywhere on your website to show visitors your site is secured. The level of security depends on the number of bits used to generate encryption key. All GeoTrust certificates support up to 256-bit encryption. Warranty is the amount payable to your site visitors if they incur losses resulting directly from an online credit card transaction as a result of a mis-issued GeoTrust SSL certificate.